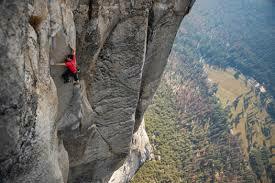 The topic came up again for me after watching Free Solo, a stunning documentary of the spectacular, daunting, dazzling, first and only free climb of El Capitan in Yosemite. Here’s an interview about the making of the film. I was struck when I heard Alex Honnard, the star climber, talk about his lack of affection growing up, how “good enough never was”, and then to hear him talk about his experience of bottomless self-loathing. This does not take anything away from Alex’s accomplishments. It does help to explain his drivenness. Back to earth! Self-loathing: feeling it, healing it. I so clearly remember how at times, how many times, I have felt “not good enough”, not likeable; how I needed approval, wanted desperately to be included… as a teen, a young adult, all the way through my adult life, until I started to “get it” that there’s another way. According to this article, and general wisdom, causes of self-loathing — low sense of self-esteem, lack of OKness with who we are — include imperfect parenting, and the unique ways we responded to it. We develop our own personal strategies, structures and “behavioural loops” that we carry forward in our lives. It’s important to remember: we did the best we could do at the time, and the strategies let us survive… And so did our parents. Nobody to blame, no shame. On the contrary, it’s compassion, kind regard, curiosity, and courage…that are called for. No parenting is perfect, and we have all been hurt, and are needy in some ways… AND we all have the opportunity to grow and heal… become more healthy, whole, at ease…more able to be ourselves, OK with ourselves, and let others be themselves… Wow, what a concept! Self-loathing is a pretty strong phrase, maybe that doesn’t resonate with you. 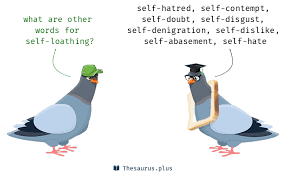 But we can all certainly relate to the term, “Inner Critic”… that inside voice that is harsh on us, and that leads us to seek/need validation from the outside, to perform, be better, best….because our own basic healthy sense of OKness is underdeveloped. Jo Barrington says explicitly, “…a nasty point of view toward yourself is never warranted. ..The proper viewpoint toward yourself should be one of friendship. Think about yourself and treat yourself as you would a close friend; respectfully and with affection. With understanding and empathy. And maybe most importantly, with a sense of easiness and humor.”:-) Easier said than done, but good to try for! I found it really important, got with a new clarity, that the Self-loathing, or the Inner Critic, is NOT the same as our conscience. The Inner Critic is always mean/harsh — it dumps on us, shames us. Our conscience is a moral compass…and can be our friend and guide. Lots more one could say about that, maybe at a different time…Suffice it to say for now that our conscience is NOT the self-critical voice. How to overcome/heal the Inner Critic — the Self-loathing? It takes awareness and definitely some attention, but, happily, the work is not all drudgery, It can be illuminating, freeing, and sometimes even quite light… to learn to be our own good friend, not to mind what others think (so much), not to need outside validation (so much), to be OK even when we are misunderstood, when we make mistakes! Here’s a classic book on this healing process: Soul Without Shame by Byron Brown. 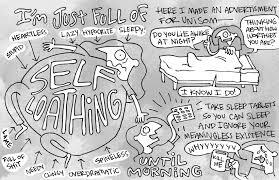 Barrington concludes with, “Challenging the tendency toward self-loathing is one of the most valuable uses of our time and energy…” Wow again! How well, and with an ache of compassion, do I remember my early insecurities, desperately wanting to be accepted and liked by others….AND I also remember how gradually it began to shift… as I began to realize and embody that others are not responsible for my happiness.. (not a husband, partner, or anyone else!) I was in my mid forties (yikes!! )… and the journey continues today… learning to be OK with mistakes, not always being liked, not being seen the way I’d like. Getting acknowledgment is nice…but not needed for a basic sense of OKness. In closing: here’s a link to the 20 talk about shadow work, very related to this topic of early wounding, by Philip Be’er, a leader in the subject: self-loathing: feeling it, healing it. He uses the word Behavioural Loops, and it is key to understand if we want to heal old wounds and build healthy relationships — to ourselves and to others. Jill Schroder is the author of BECOMING: Journeying Toward Authenticity. BECOMING is an invitation for self-reflection, and to mine our memorable moments for insights, meaning, andgrowth. Check the website for a sample chapter, or see the reviews to get a flavor for the volume. Follow me on Twitter, let’s be friends on Facebook.